The background idea is that our brain organizes things using relationships between these things and that all these billions of relationships form lots of patterns. The music we listen to also has lots of patterns, and when these two patterns resemble each other enough, the patterns in the brain are ‘excited’. We perceive the excitation of these brain patterns in various ways, and some of these are what I think is the ‘drug-like’ experience we get from music. 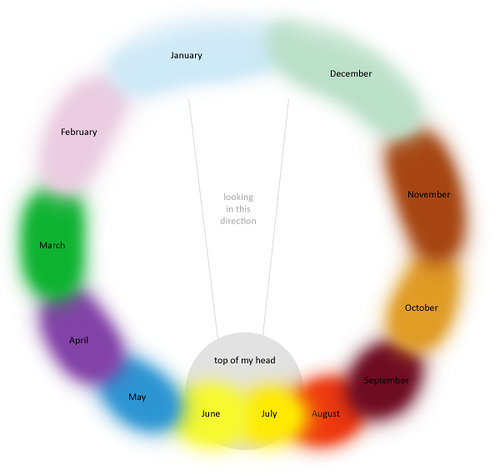 A visual pattern for the months of the year. I think we all organize the world into patterns; patterns in 2D [heights of family members in an atomic family] and 3D space [mountains are larger than molehills], of color, texture, sound, … moving things,… using various values of attributes that we are familiar with through our 5 senses [bright versus dim, red versus orange,. sharp versus dull….]. Studies of extreme debilitating versions of this is apparently called Synesthesia. [For myself, the colors of the calendar here are pretty close – but colors do not play a large part in my mental patterns for months (but my patterns for various people does use colors). However, for me, the months are rectangular, like a sidewalk; my head is also close to the current month, facing slightly ahead of the current week, and I think there is a characteristic note (of a specific frequency and duration) associated with each month, I just haven’t worked out quite what it is yet since I never really thought about it until now]. The point here is that the patterns in the brain do NOT have to be sonic patterns in order to resonate with the patterns in music, they just have to be related in some structural way. Our brains are good at matching patterns that are similar but not exact matches for each other, as in ‘you look just like this other bloke I know’ [but of course he does not look exactly like the bloke you know, he only ‘reminds’ you of him, otherwise you would ask him what the hell is he doing here at this Justin Bieber concert too?]. On a related idea of patterns in the brain and music. When I used to ski 30+ times a year and really get into a groove, the Blue Danube used to pop into my head. This was when I was almost exclusively listening to rock and roll. Similar patterns? Similar timing?